Merry Mint Cake for sale. Buy online at Zingerman's Mail Order. Gourmet Gifts. Food Gifts. Chocolate cake filled with a rich chocolate mint buttercream then iced with vanilla buttercream. 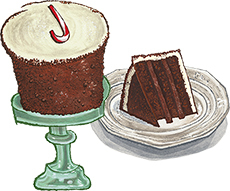 Cloaked in crushed brownie pieces and topped with a fondant candy cane. The pastry magicians at Zingerman’s Bakehouse love baking cakes above all else. Wedding cakes, birthday cakes, coffee cakes, everyday cakes—whenever there are cakes to bake you can bet they’ll be excited and what comes out of the oven will be incredibly tasty. The fondant cakes like our birthday cake are the show-stoppers, with their intricate decorations. Coffee cakes are our everyday best sellers. But here in Ann Arbor, special occasions are marked most often by buttercream cakes. The showpiece on this cake is traditional buttercream frosting. Swiss style, it's made by whipping fresh eggs and sugar into a meringue, then mixing in real Wisconsin butter and Madagascar vanilla. Our cakes are also marked by what they don't contain: no artificial anything, no mixes, no shortening. These are the ingredients your grandmother would use when she baked.